← What is the best way of selling Japanese produce in China? 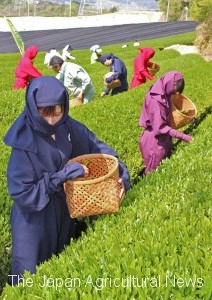 This year’s first pick of first flush green tea in Shiga Prefecture is picked by Koga ninja! SHIGA, Apr 24 – On April 23, 2018, Shiga Prefecture celebrated its first harvest of the first flush spring green tea at GreenTea Tsuchiyama, a tea grower in Koga, the region known for traditionally producing high-quality tea leaves. To draw more attention to the tea leaves from Oumi region (a part of present Shiga Prefecture), the tea leaves were handpicked by the locals dressed in ninja costume. The temperature this year was low until the end of February, but the weather improved from the end of March. So, the tea shrubs grew well and is ready to offer high-quality products.